“Hermitage of the body means reducing mundane activities and emphasizing Dharma. We direct our minds to positive qualities such as love and compassion, joy and appreciation, and with these as a foundation perform meritorious activities. Avoiding actions that are harmful, doing what is beneficial for us and for others—this is known as the hermitage of the body. Hermitage of speech means trying to avoid all talk that is disrespectful, harsh, and negative—anything that brings harm to yourself and others. This kind of talk is known in the Buddha’s teaching as gossip. Gossip has no good qualities. Once begun gossip tends to travel, accumulate, and disturb many people. Reduce and ultimately avoid gossip—this is part of the practice of the hermitage of speech. Another aspect of the hermitage of the speech is to not spend much time talking about trivial things. In other words reduce mundane conversation. Then there is silence. When you practice silence you are self-contained and more inward-looking. You notice the busyness of your body, speech, and mind and your self-awareness grows. Eliminate gossip, reduce mundane conversation, and practice silence—all these make up what is known as the hermitage of speech. The third one is hermitage of the mind. Reduce grasping, clinging, doubt, hesitation, and all thoughts related to the five poisons— ignorance, attachment, anger, arrogance, and jealousy. However these emotions manifest in you, individually, in combinations, or all together—stay away from them, do not indulge them, let them go. That is known as hermitage of the mind. Photo of Ven. Khenpo Tsewang Dongyal Rinpoche with the PBC NYC Sangha on January 1, 2016. 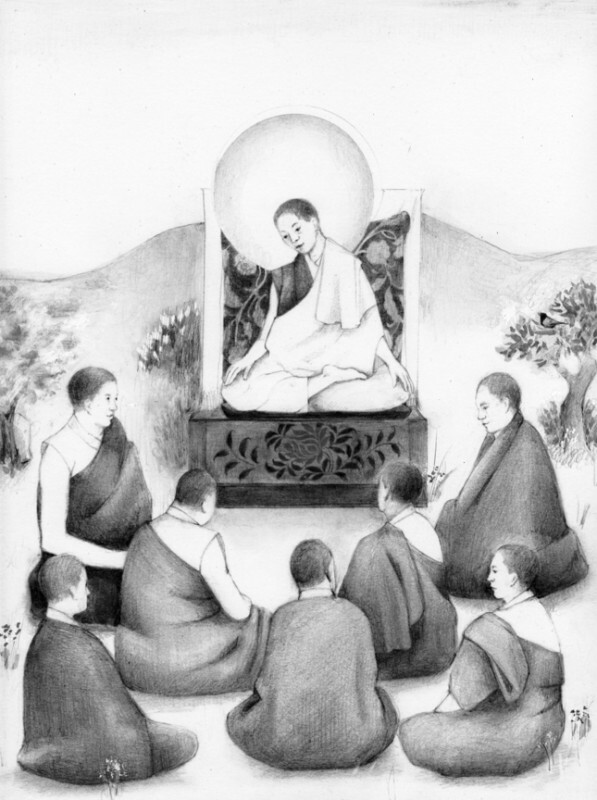 Line drawing of Aro Yeshe Jungne with his disciples by Theresa Cooper.